LAS VEGAS, Jan. 3, 2017 /PRNewswire/ -- CES® -- Today, Kérastase, the worldwide leader in professional luxury hair care, in partnership with Withings, the leader in the connected health revolution, announced the Kérastase Hair Coach Powered by Withings — the world's first-ever smart hairbrush. Developed in collaboration with L'Oréal's Research and Innovation Technology Incubator, the brush features Withings' advanced sensors and seamless product design along with L'Oréal's patent-pending signal analysis algorithms to score the quality of hair and monitor the effects of different hair care routines. An accompanying mobile app provides additional insights and customized product recommendations to help people better care for their hair. The brush is a recipient of this year's International CES Innovation Award, which celebrates outstanding product design and engineering in new consumer technology products. Conductivity sensors to determine if the brush is being used on dry or wet hair in order to provide an accurate hair measurement. The brush itself is splash proof. These sensors feed data automatically via Wi-Fi or Bluetooth to a dedicated mobile app, which then takes into account weather factors like humidity, temperature, UV and wind, which also impact hair's manageability and quality. By tracking the way a person brushes and factoring in aspects of daily life, the smart brush app provides valuable information including a hair quality score, data on the effectiveness of brushing habits, personalized tips and Kérastase product recommendations. "Technology is transforming consumers' daily beauty routines, and smart devices have huge potential to impact how we care for our hair and skin," said Guive Balooch, Global Vice President of L'Oréal's Research and Innovation Technology Incubator. 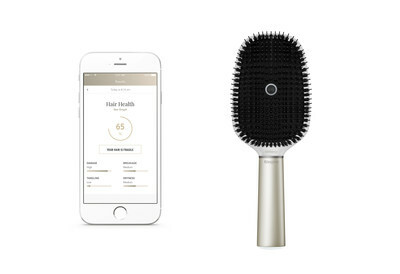 "By using connected technologies to upgrade the hairbrush — something the average consumer uses every day — Withings and Kérastase have reinvented what a person's relationship with their hair can look like and are showing how connected devices can revolutionize the beauty industry." The hairbrush is a three-way collaboration between Kérastase, Withings and L'Oréal's Research and Innovation Technology Incubator. The incubator — a lab dedicated to meeting the needs of beauty consumers through disruptive technology innovations — oversaw all brush testing and developed the signal analysis algorithms that power the device. Withings developed the hardware, including the brush's combination of smart sensors, and spearheaded the mobile app UX. L'Oréal-owned Kérastase provided its expertise in professional hair care on the development and design of the brush along with digital and personalized content and recommendations in the app. "For more than 50 years, Kérastase has pioneered luxury hair care that's at the forefront of scientific research," said Vincent Nida, General Manager of Kérastase. "Our customers see their hair as intimate expressions of their identities, and we are always looking to provide them with high quality tools and technologies that make their hair as beautiful as possible. With the Kérastase Hair Coach Powered by Withings' personalized data and real-time product recommendations, we are bringing new insights to customers' homes for an even more bespoke hair care experience." Retailing for under $200, the brush will be available mid-2017 at select Kérastase hair salons and the brand's website, and through Withings' online sales and distribution channels. Because women see their hair as an intimate expression of their identity, Kérastase offers them very personal care for exceptional hair, combining the expertise of the best hairdressers in the world with the knowledge of scientific teams working at the forefront of hair research. With over 100 products in 10 hair care ranges and 1 styling range, the professional luxury hair care brand is sold in over 60 countries to over 20 million consumers. As a dedicated partner to hairdressers since its creation in 1964, Kérastase's in-salon hair diagnostic, ultra-personalized products and sensorial rituals are exclusively available in just 1% of the world's salons. Withings, part of Nokia, leads the connected health revolution. We invent beautiful, smart products and services that help people become happier and healthier. Founded by visionary innovators Cédric Hutchings and Eric Carreel in 2009, Withings was acquired by Nokia Technologies in May 2016, and will accelerate innovation in the digital health space. The award-winning range of Withings products built across the health spectrum includes activity trackers (Withings Pulse, Activité and Go), the Wi-Fi scale and health station (Body Cardio), the Wireless Blood Pressure Monitor, the security camera with air quality sensors (Withings Home), the smart temporal thermometer (Withings Thermo), and an advanced sleep system (Withings Aura). Every piece of collected data comes to life in Withings applications where users can find coaching, motivation, and insights to shape key aspects of their health. 1 Luengo, G.; Galliano, A.; Dubief, C. (2014), Aqueous Lubrication in Cosmetics. Hackensack, New Jersey: World Scientific Publishing.